With the introduction of the Morphologi G3-ID system last year, Malvern Instruments is providing researchers with the ability to apply morphologically directed Raman spectroscopy to a range of different sample types. Such advanced particle analysis is proving valuable and highly effective in applications that include inhaled product characterization and pharmaceutical bioequivalence studies, bioequivalence for nasal sprays being referenced specifically in a talk given by the FDA at this year’s IFPAC conference [January 22-25, 2013 Baltimore, MD, USA]. The use of morphologically targeted Raman spectroscopy has also been described in an independent article, as part of granulation studies, to provide the physical and chemical identities of particles in mixed populations . 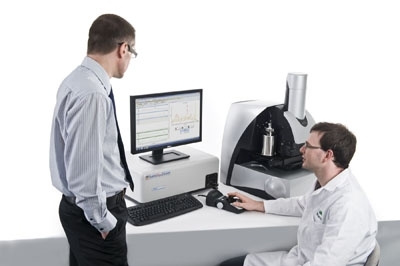 By combining automated particle imaging with Raman spectroscopy, the Morphologi G3-ID offers a single platform for the measurement of particle size, shape and chemical identity. The technology involved enables independent characterization of individual components present within a blend or mixture, while the instrument itself is designed for automation and ease of use. Standard operating procedures control all aspects of the measurement from sample dispersion through to size, shape and chemical analyses, enabling automatic selection, targeting and chemical classification of 1000s of individual particles. Justin Pritchard & Martin Warman; Advanced Particle Analysis Integrated Into Performance-directed Characterization; American Pharmaceutical Review, July 2012.